To find and order your scent, choose from A-Z Scents, Scent Collections, Featured Collections or any page that shows scents. Click on your favorite scent and select from the PRODUCT SELECTION area on the scent page. Demeter Fragrance Library ignites your senses with more than 300 different fragrances inspired by everyday objects and experiences. These are simple, friendly and familiar scents inspired by the beautiful smells that surround us everyday, adjusted to be both recognizable and wearable. Demeter colognes are single note fragrances, meaning they are the smallest combination of ingredients that express a single, identifiable smell or idea. Notes and accords are also linear, which means that they express their nature and character immediately, and do not change over time. That makes them perfect for daily wear. No artificial colors. 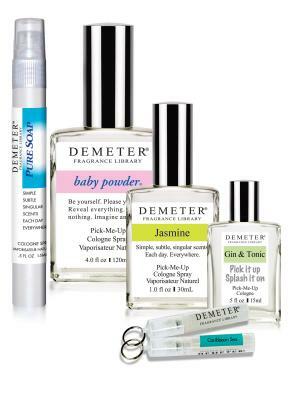 Any color in a Demeter scent is a natural product of the ingredients used to make the scent. This is why most Demeter scents are clear.